Isao Takahata has long been overshadowed by longtime colleague and Studio Ghibli cofounder Hayao Miyazaki. The younger man (Takahata is 78, Miyazaki 72) has had more and bigger hits, including his latest, the World War II-themed “Kaze Tachinu (The Wind Rises),” while Takahata’s last feature animation, the 1999 family comedy “Hohokekyo Tonari no Yamada-kun (My Neighbors the Yamadas),” was a rare Ghibli box-office disappointment. And yet Takahata is every bit the anime master that Miyazaki has been widely proclaimed to be, if one with a different style and concerns. His Ghilbi films tend to be more realistic than Miyazaki’s, beginning with 1988’s “Hotaru no Haka (Grave of the Fireflies),” an unsparing drama about children struggling to survive in the destruction and chaos that enveloped Japan toward the end of WWII. It is the most emotionally devastating Japanese film I have ever seen, while being free of the cloying sentimentality that is a prerequisite for commercial tearjerkers here. So Takahata’s latest and quite possibly last film, “Kaguya-hime no Monogatari (The Tale of Princess Kaguya),” might seem to be a departure, since it is based on the oldest-known Japanese folk tale, which dates to the 10th century. Also, its gestation, eight years by the count of producer Yoshiaki Nishimura, was long even by Ghilbi’s relaxed standards, with Takahata’s reluctance to commit being one factor, production delays another. 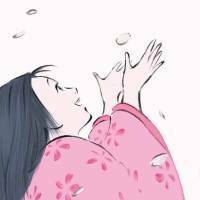 But far from an uncomfortable fit or a labored effort, “Princess Kaguya” has the feel of a true Takahata film, from its unshrinking emotional fidelity to its sudden, exhilarating leaps into fantasy. The animation, with its combination of bold, dynamic strokes and delicate, lightly brushed colors, may initially look underdone compared with other Ghibli productions, with their lush backdrops and fine detailing, but as the story progressed, I found this more impressionistic style somehow suggestive of the story’s origin in the most ancient of tales — and our common desires, fears and dreams. That tale is known to every Japanese, if not to the outside world, though its motifs are also found in Western fairy tales (“Thumbelina,” “King Thrushbeard”). It begins with an old bamboo cutter, Okina (voiced by Takeo Chii), happening upon a strangely glowing bamboo in the forest and finding inside a tiny, perfectly formed girl (Aki Asakura). He takes her, cradled in his palms, to his wife Ouna (Nobuko Miyamoto), but the little creature soon morphs into a baby that the flummoxed couple decides to raise. The strangeness continues as the baby grows far faster than normal (in one brilliant, spooky sequence she quickly progresses from flailing limbs to a hesitant first step), while taking a laughing delight in the world around her. Okina finds more treasures in the bamboo, including gold nuggets and kimono meant for a princess — that is, for his pretty adopted daughter, who is called Takenoko (Bamboo), and is obviously destined for bigger and better things. Takenoko, however, is happy with the humble places and common people she knows, especially the leader of the neighborhood kids, the rugged, pure-hearted Sutemaru (Kengo Kora). Instead, her newly rich parents install her in a mansion, surround her with servants and have her trained in the ways of the aristocracy, from playing the koto to painting her teeth black. (The former she masters, the latter she indignantly rejects). 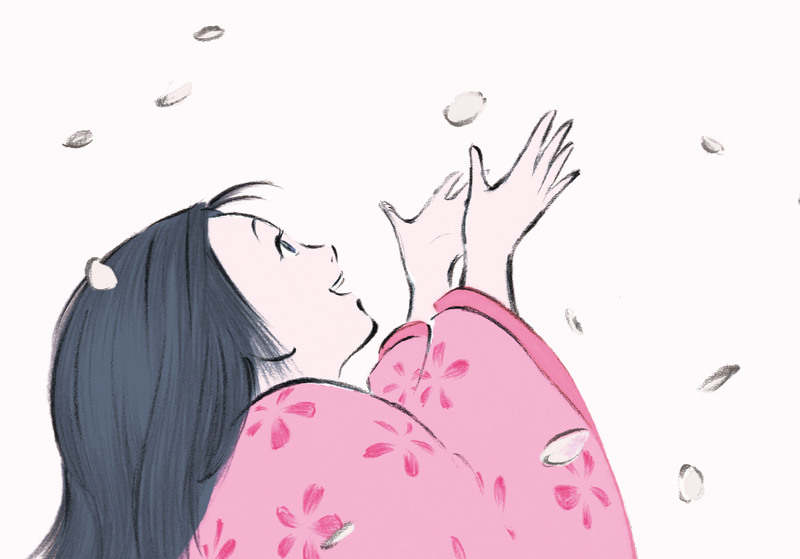 This beautiful, accomplished, fully grown girl, now called Kaguya-hime (Princess Kaguya), attracts five well-born, ridiculously self-important suitors, but she rejects them all, even when they make seemingly miraculous efforts to meet her absurd demands. Finally the emperor, who is young, handsome and the most arrogant of all, tries to win her hand, but she spurns him as well — and reveals that she is from the moon and must soon return to the land of her birth. This is all pretty much from the folk tale, which raises the question of what, beyond their way of telling it, Takahata and his collaborators have brought to it. The film’s tag line, “A princess’ crime and punishment,” offers a clue, while Takahata himself has said he wanted to explore what “crime” Princess Kaguya might have committed, since the original story is silent on that point. His exploration, though, has little to do with plot, everything to do with his heroine’s emotional and spiritual journey — and the way it ends. Not to enter spoiler territory, but the climax is a haunting, wrenching evocation of mono no aware — or as it is literally translated, the pathos of things. The basis of Japanese aesthetics since time immemorial, mono no aware is hard to define, but “The Tale of Princess Kaguya” brilliantly illuminates it with images of life at its transient loveliest, of parting in its terrible finality. There is a deep wisdom in this film, but a deep sadness too. If it is Takahata’s farewell, it’s one that will have a long echo, just like his 1,000-year-old source. Fun fact: Hayao Miyazaki collaborator Joe Hisaishi supplied the soundtrack, his first-ever for a Takahata film. The theme song, “Inochi no Kioku (Memory of Life),” is sung by Kazumi Nikaido.